Last year, H6 Android Netbook featured AllWinner A10 Cortex A8 processor, 1GB RAM, 4GB Flash, and came with a 10.1″ display with 1024×600 resolution, and people who tried did not seem very satisfied with their purchase. This year however, we should get more better hardware thanks to devices like N70-A and N70-B, respectively powered by AllWinner A20 with 1GB RAM, and AllWinner A31 with 2GB RAM, that both come with a 13.3″ display (1280×800). 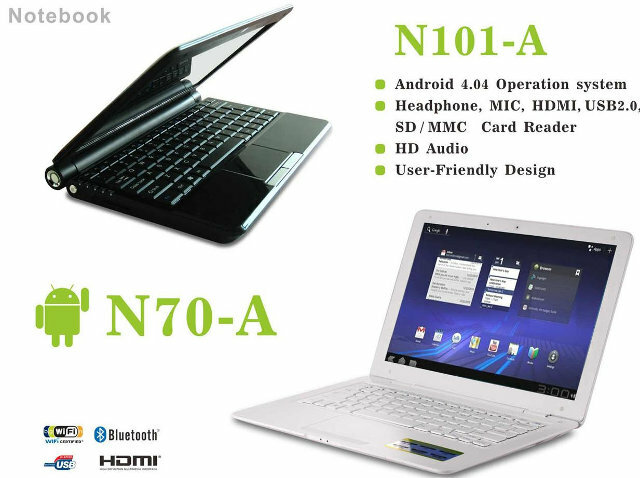 There’s also N101-A model powered by AllWinner A20, but it comes with a 10.1″ display with 1024×600 resolution. All models are available with 8, 16 or 32GB flash, feature Wi-Fi 802.11n and Ethernet connectivity, a 0.3MP front camera, an SD card reader, 2 USB ports, 1 HDMI output, as well as mic IN and headphone jacks. For some reasons, AllWinner A20 models runs Android 4.2.2, but AllWinner A31 still runs Android 4.1.2. You should be able to load Linux on AllWinner A20 based model in the near future, including 2D/3D hardware acceleration, and Linux should run with AllWinner A31 without GPU acceleration, at least until Ubuntu 14.04 (Tyrannical Turtle?) is released, or another OS taken advantage of libhybris is released. There’s no information about pricing or availability at this stage, but according to Padhz, we should now more at Computex on June 4-8, 2013, in Taipei, Taiwan. The 13.3″ is 1280×800, I think it’s OK. I normally only have issues with 1024×600 displays, like for the 10″ version.